International correspondent Soraya Sarhaddi Nelson is based in Berlin and covers Central Europe for NPR. Her reports can be heard on NPR's award-winning programs including Morning Edition and All Things Considered. She was previously based in Cairo and covered the Arab World for NPR from the Middle East to North Africa. Nelson returns to Egypt on occasion to cover the tumultuous transition to democracy there. In 2006, Nelson opened the NPR Kabul Bureau. During the following three and a half years, she gave listeners in an in-depth sense of life inside Afghanistan, from the increase in suicide among women in a country that treats them as second class citizens to the growing interference of Iran and Pakistan in Afghan affairs. For her coverage of Afghanistan, she won a Peabody Award, Overseas Press Club Award and the Gracie in 2010. She received the Elijah Parish Lovejoy Award from Colby College in 2011 for her coverage in the Middle East and Afghanistan. Nelson spent 20 years as newspaper reporter, including as Knight Ridder's Middle East Bureau Chief. While at the Los Angeles Times, she was sent on extended assignment to Iran and Afghanistan following the Sept. 11, 2001 terrorist attacks. She spent three years an editor and reporter for Newsday and was part of the team that won the 1997 Pulitzer Prize for covering the crash of TWA Flight 800. A graduate of the University of Maryland, Nelson speaks Farsi, Dari and German. December 31, 2018  Angela Merkel is still the chancellor of Germany and could stay in that job until 2021 — although you could be forgiven for thinking otherwise, given the speculation over who is to be her successor. December 7, 2018  On Friday, the Christian Democratic Union chose its general secretary, Annegret Kramp-Karrenbauer, a strong Merkel supporter. November 26, 2018  British Prime Minister Theresa May has the support from European Union leaders on a Brexit deal. But it must still be approved by Parliament in the United Kingdom. November 25, 2018  Leaders of the European Union have approved a plan for the United Kingdom to leave the EU. The U.K.'s parliament must still vote on the Brexit deal. November 25, 2018  After a messy, year-and-a-half long battle, European leaders today signed off on a divorce deal for the United Kingdom, which is leaving the European Union in March. November 23, 2018  Officials from the United Kingdom and the European Union on Thursday approved a draft agreement on their future relationship — for when the U.K. leaves at the end of March 2020. November 22, 2018  The Polish government is asking the U.S. to open a military base in Poland as a counter balance to Russia. They've offered the U.S. up to $2 billion, as well as a promise to call it "Fort Trump." October 29, 2018  Merkel had told her party she won't run for re-election as its chairwoman. 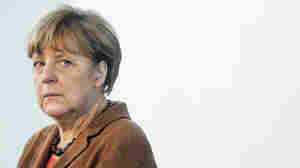 Her decision comes after the CDU suffered heavy losses in regional elections. She's held the chancellor post for 18 years. October 17, 2018  British Prime Minister Theresa May was urged to bring "new facts" to Wednesday's summit of E.U. leaders in Brussels. But U.K. ministers say the ball is the EU's court, so Brexit talks appear to be at stalemate as the clock ticks down. October 17, 2018  EU leaders are gathering in Brussels on what is supposed to be the deadline for a deal to ease the U.K. out of the bloc next March. Plans to unveil a draft declaration have been scrapped. 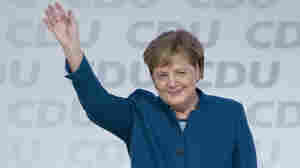 October 15, 2018  Bavarian voters dealt German Chancellor Angela Merkel a tough blow Sunday. Her conservative allies there are projected to receive their second-worst result in regional elections since 1946. October 13, 2018  A booming economy and ever fewer migrants crossing the border haven't eased a populist backlash against the German chancellor's political allies in the wealthy alpine state of Bavaria. October 11, 2018  A prosperous area of Bavaria has become a stronghold for the far-right AfD. If the party does well in Sunday's regional elections, it could knock Chancellor Merkel's closest political ally from power. October 5, 2018  This year's winners of the Nobel Peace Prize are a Congolese surgeon and a Yazidi activist, both cited for their work opposing sexual violence against women in conflict zones. October 5, 2018  Denis Mukwege and Nadia Murad have been named winners of the prize. The committee praised them for being symbols in the fight to end the use of sexual violence as a weapon of war and armed conflict.